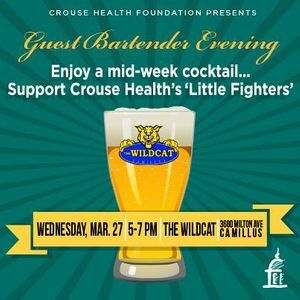 SAVE THE DATE: Join us on Wednesday, March 27 from 5 – 7 p.m. for a Guest Bartender Evening at The Wildcat Sports Pub, to benefit Crouse Health’s Baker Regional Neonatal Intensive Care Unit. Guest Bartenders Amy Robbins, 93Q; John Bergemann, Crouse Health Human Resources Director; Chris Fatti, DPM, Syracuse Orthopedic Specialists, P.C. ; Daniel Lostumbo, Vice President Finance, The Hayner Hoyt Corporation; Betty O’Connor, Crouse Health Women’s and Infant’s Services Director; and community volunteer Nancy Pasquale will be serving drinks at the cash bar and encouraging patrons to donate tips benefitting our #CrouseLittleFighters. Invite your colleagues, friends and family to join! There is no cover charge. Can't make it but want to make a donation to our Little Fighters? 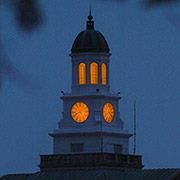 Visit crouse.org/littlefighters to learn how you can help!